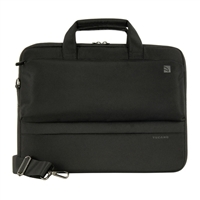 Slim, compact bag sized to fit 13" and 14" notebooks and Ultrabook along with the MacBook 15" with Retina display, with practical organization for everything else you need to carry. Inside the main compartment there is a dedicated tablet compartment compatible with iPad and tablets. An internal fleece lined strap helps to carry and protect the equipment. The convenient front pocket offers a quick access to always keep your items on hand. Back flat compartment for newspaper, magazines or other essentials. Carrying options include shoulder strap or top handle. 15.75" x 11.8" x 2.75"